Filmmaker Jeri Vaughn held the world premiere of “Winging My Way Back Home: The Stripling Fiddle Legacy” at the Charlie Stripling Fiddlefest and Fish Fry in Belk, Alabama Nov. 13, 2010. The auditorium was filled and included at least 25 Striplings and people who attended dances where Charlie played. W.B. (Bruce) Reid and Bonnie Zahnow performed, with guest appearances by Lee's two daughters, all from the Seattle area, and his sister, Elsie Mordecai of Kennedy, Ala. Red Mountain of Birmingham and Jim Brock and Son also performed Stripling Brothers' tunes. Winging My Way Back Home traces Lee Stripling's role in reviving old-time music in the Pacific Northwest. It tells of the hardships and triumphs of Lee's father, Charlie Stripling, who recorded more than 40 tunes with his brother Ira in the midst of the Great Depression, influencing fiddlers around the world. And, through the story of Lee's amazing comeback, the film demonstrates the resilience of an optimist born with music in his soul. The event was sponsored by the Alabama Folklife Association with support from the Belk Community Center, the National Endowment for the Arts, and the Alabama State Council on the Arts. Belk is not far from the Stripling home place in Northwest Alabama along the red dirt roads outside of Kennedy. Additional funds are needed to purchase music rights. Anyone contributing $50 or more will get a DVD of the film with a bonus audio CD of field recordings of the Stripling Brothers from 1952 and additional music. Send your tax deductible check to the Alabama Folklife Association, PO Box 4697, Montgomery, AL 36103-4697 and write STRIPLING FILM in the memo line. Many thanks to Joyce Cauthen, Mary Allison Haynie and the Alabama Folkife Association for their continued support. The Rev. Robert Stripling, the eldest of Charlie Stripling's nine children (mother Tellie Sullivan Stripling), passed away in Montgomery, Ala., Oct. 26, 2010. Robert accompanied his father on guitar when Charlie's brother Ira retired. He later led swing bands in World War II in North Africa, where he served as an aircraft mechanic. Robert spent most of his life in Birmingham. Though he was 18 months older than Lee, the two brothers were as close as twins. Music historian Joyce Cauthen, retired executive director of the Alabama Folklife Association, interviewed Robert on Oct. 8, 2010 for a radio show that can be heard by right clicking here. The DecoGals, all long-time fans and supporters, kept Lee's image alive by putting up posters of their wonderful original portrait of Lee all over at the 2010 Festival of American Fiddle Tunes in Port Townsend. The art sold at auction to Lisa Boveng with the purchase price matched by Ed Littlefield, Jr. Our thanks to all involved! 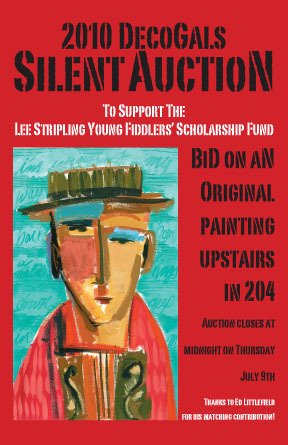 The DecoGals remembered Lee again at the 2011 Fiddle Tumes with a second donation. The Fund got a financial boost from Django Amerson of Portland, a fiddle and banjo player who performed at the 2010 Fiddle Tunes. Django has been coming to the festival for 24 years, sometimes on scholarship, and now is providing the same opportunity for others. A series of tributes and memorials were held in Seattle, Alabama, Montana and New Mexico following Lee's death on April 20, 2009. Each was something Lee would have to loved to attend. An estimated 250 people attended Lee's memorial celebration in Seattle in May or 2009, largely organized by his cherished old-time music and contra dance community, masters at putting on a good party. Musical tributes were performed in Seattle and at the Santa Fe Old Time Music Festival, where W.B. (Bruce) Reid and Bonnie Zahnow played beautifully at what was the last scheduled gig for the Lee Stripling Trio. Lee sat down (but never still) for a long weekend of recording sessions in August 2008 with Paul Anastasio, Rich Levine, Matt Sircely and Rus Davis for a new CD of twin fiddles, guitar and mandolin. The album, predominately Stripling Brothers tunes, was not completed before Lee's death. Watch “My Isle of Golden Dreams” for a sample. In the famous words of Lee Edwin Stripling, the participation of Lee, W.B. Reid, and Bonnie Zahnow drew "more accolades than ever before" at the 2008 Festival of American Fiddle Tunes at Fort Worden held in July near Port Townsend, Wash. Lee was previously a faculty member with his brother Robert in 2000. In addition to workshops, concerts and a preview of the upcoming documentary, there was a Fourth of July highlight when the Alabama contingent pitted inspirational Dixie tunes against darned Yankee fiddle numbers on the front porch of a century-old officer's home. Fireworks erupting in the bay paled compared to those on the porch. The Lee Stripling Band, which added bass player Tony Mates to the Trio, was nearly washed away by affection at the 2008 Portland Old-Time Music Festival in January, as Lee reports it. Audience response for the Main Stage performance was the best reception yet (see below). Tony also plays with Lee's Six Footed Boys. He toured with the Lee Stripling Trio in Alabama in 2007. A knowledgeable, sold-out crowd poured appreciation toward Lee and the The Lee Stripling Trio after a featured performance in mid September at the Freight House in Berkeley, Calif., for the Old Time Music Convention. Some -- well, one of his daughters -- felt his fiddling was so inspired he must be channeling Charlie. The original Stripling Brothers music was mentioned and played throughout the weekend. More details here.